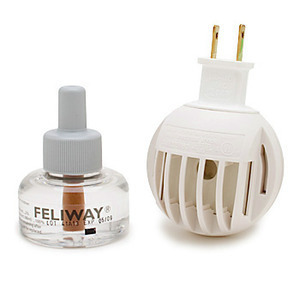 Feliway uses synthetic feline facial pheromones to end urine marking and scratching and to comfort cats in stressful situations such as being alone in the house, visitors to the home, new pet or family member, moving to a new home, visits to the veterinarian, adjusting to a new environment, or multiple cat households. 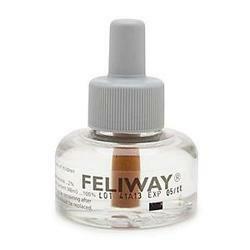 Feliway mimics a natural comforting facial pheromone produced by cats. Product is odorless and non-toxic, does not affect humans. Not a drug or tranquilizer. Ingredients: Analogue of feline facial pheromone 2%, excipients to 100 g.
To use: simply plug the unit into an outlet in the room your pet frequents; effective in areas up to 650 square feet. Comes with one plug-in and one 48 ml bottle (1.691 oz.). Refills sold separately. Innovative Feliway Pheromone Spray leaves a scent recognized as familiar and comforting to cats by mimicking the scent produced in a cat’s cheek when it rubs against an object. Helps to comfort cats in stressed environments, calm nervous animals during transport, and inhibit urinary marking. Spray directly onto surfaces soiled by cat or on areas attractive to cat to prevent scratching and marking behavior. 2.55 oz (75 ml) spray bottle.